Lately Alaska has been feeling the heat, particularly in the part of it you’d least expect: the northern part. As many have noted, places like Deadhorse have had heat-wave conditions despite being within 50 mi. of the Arctic ocean, and old records haven’t just been broken they’ve been smashed. It’s not just last week, the whole year (so far) has been unusually warm in our northernmost state. 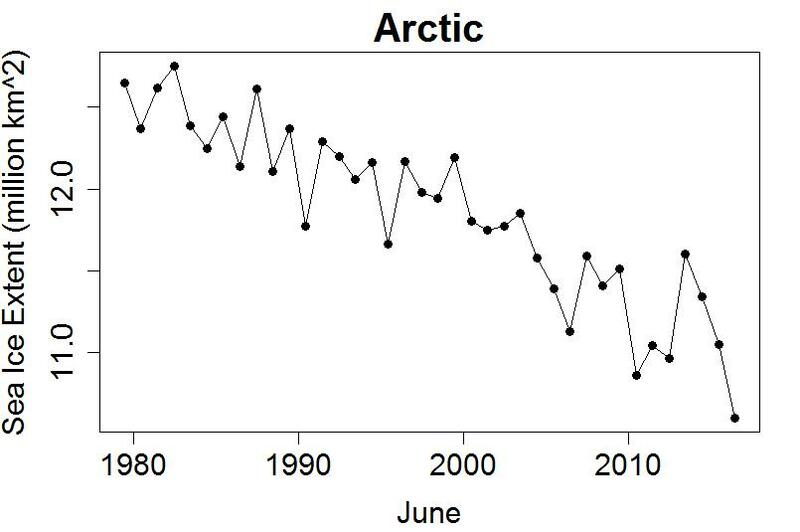 A big contributor to the rapidity of changes in the Arctic has been the disappearance of Arctic sea ice. Ice is highly reflective, sending incoming sunlight back to space, but when sea ice melts it uncovers the ocean beneath, which absorbs that sunlight, increasing our planet’s energy imbalance. This also affects the flow of air, bringing about changes in the very nature of how air masses move about — changes which are implicated in the shifting patterns and persistence of heat waves, storms, and particularly rainfall. Yes, we really are changing the fundamentals of weather, in ways that the victims of recent floods and heat waves can tell you, we already don’t like. Even greater changes are coming, and we’re gonna hate those even more. It’s all part of the trend, which has been decline — not just of the annual minimum (usually in September) but year-round. Since about 2007 it seems to be showing wild fluctuations. But that’s a false impression proceeding from the heat-oppressed Arctic; it’s really due to the fact that the seasonal cycle itself changed (it got bigger), so subtracting the old seasonal cycle still leaves part of the new seasonal cycle in place. They’re in broad agreement, giving a visual impression of steady decline until about 2002, followed by faster decline until about 2008, followed by a return to the previous rate of decline. This particular graph shows just about all we can be confident in. The data are noisy enough that those are the only changes we can assert with genuine statistical justification. Yes there was a speedup of ice loss from about 2002 through 2006, after which the rate of decline is indistinguishable from its previous rate. Arctic sea ice was already in dramatic decline, but since its most recent trend change it has been consistently lower that would have been expected, even accounting for the already-serious declining trend. Some recovery! For those unfamiliar with the way deniers deny, let me tell you what’s behind their “recovery” nonsense. By finding a small enough time span, ingoring all context, and seeing only what they want to see, they can make a graph which they think shows “recovery.” It’s totally misleading, so to them it’s salvation, because truth is against them, so they must deny it. Your anomaly graphs except the first one are not showing anomaly, but data corrected for the seasonal effect. Off course, this does not change the information carried. Seems like the folks watching global warming fall into three categories: deniers, lukewarmers, and alarmists these days. I would probably qualify as an alarmist and lukewarmer folks like to give alarmists a bad time, but as days and weeks go by, more and more folks watching the AGW thing get alarmed. Probably with good reason. Folks with an intellectual/scientific interest in AGW have moved slowly toward alarm as globe warms faster than expected, or sea ice disappears faster than expected, or Antarctica/Greenland melt faster than expected, etc. I can’t think of a single dynamic system that is moving slower than expected in response to AGW. I think it would be a good thing if most of the folks on the planet were suddenly alarmed about AGW. Thanks for this post. I think the heat buildup in far north is alarming and has consequences for a lot of beings on the planet. Just a little proof reading here. The first figure (the third overall) to show an anomaly has what looks like the correct units and scale. The remaining anomaly figures (figs 5-9 overall) appear to show an absolute scale on the y axis instead of an anomaly scale. Speaking of typos, ‘ingoring’ might be a reference to Al Gore, but I suspect it’s just a misspelling of ‘ignoring’. Interesting. I don’t know how it could be related, as it almost seems to be an inverse relationship, but a graph of methane concentration seems to show similar inflection points; a steady rise to about 2000, then 6 or 7 years of no growth, then a return to a similar steady rise. I can’t think of how Arctic sea ice cover could be affected by atmospheric methane concentration in this way. so it’s probably just a coincidence. Two other possibilities: ASI could have affected methane production, or both effects could be caused by a third factor. The people with the ability to accept data (provided at great time and effort by well credentialed individuals and groups in the field of climatology), need to ignore the ‘deniers’ (that have no education in the field of climatology and are just guessing there is no climate change problem because they don’t love their children & grandchildren more than their giant trucks), and simply get on with the business of converting the world’s energy systems to renewables. In short, ignore the idiots and deploy renewables on a massive scale. Mr. Wilcox, converting the world’s energy systems to renewables is going to take lots of money. “Well-credential individuals and groups in the field of climatology” don’t have access to that kind of money. Governments do, but they are beholden to self-interested deniers, that is, well-capitalized individuals and groups in the field of selling fossil carbon at prices that socialize the costs of “greenhouse” warming. That leaves “the market”. Unfortunately, as long as the price of fossil energy doesn’t include the costs of climate change, self-interested consumers (of whom some are idiots and some are not) won’t pay the initial price premium for alternatives, and market forces won’t drive the conversion of the world’s energy systems to renewables. A carefully-designed carbon tax would reduce or eliminate the price advantage fossil carbon enjoys over carbon-neutral energy sources, allowing the transition of the world’s energy systems to fund itself. What can you do yourself, whether you are well-credentialed or not? Advocate for a carbon tax. See carbontax.org for more info. We can quibble, but I think there’s lots of technical, business, and economic evidence we will collectively and globally move to zero Carbon energy sources, probably primarily solar + storage. The thing of it is, and here I very much agree, if we leave it to the marketplace, it won’t happen on a timeline that’s consistent with the deadlines Nature is giving us, so, there really, really need to be government incentives for pushing it faster. Moving to renewables is not only expensive but it also takes energy and other resources. If there is a concerted drive to get to zero carbon by mid century, or soon after, there could well be a spike in emissions. Damned if you do and damned if you don’t. if we leave it to the marketplace, it won’t happen on a timeline that’s consistent with the deadlines Nature is giving us, so, there really, really need to be government incentives for pushing it faster. As I’ve said elsewhere, while I don’t think a carbon tax will be sufficient to drive the transition to a carbon-neutral energy economy, I think it is necessary. A carefully-designed carbon tax would not only increase demand for carbon-neutral energy sources by making them more price-competitive, but the revenue from the tax would provide capital for investment in generation and distribution. In the U.S., political considerations favor “revenue-neutral” proposals that return the revenue to consumers as a dividend or a roll-back of other taxes, leaving investment decisions to the market. Revenue-neutrality isn’t a requirement for the demand side of the equation, however, and some or all the revenue could be used for government incentives. A portion of the revenue could also be used to address concerns for the impact of the tax on lower-income consumers. Dog help us, those choices will be made by politicians 8^(. I agree. But we sure are running out of time! 450 ppm isn’t that far away, and that generally is agreed to correspond to +2°C. We could well overshoot, and, as I recently quoted, “A slow start leads to a crash finish” in terms of pace of mitigation. I think 450 ppm CO2e is already here, isn’t it? Related to that, Michael Mann calculated that CO2 (not CO2e) needs to not get above 405 ppm to have a chance of staying below 2C. Well, it was above 405 for many months this year (and may still be). Surely the chance of staying below 2C are gone but we still need to mitigate. 450 405. Consensus is that it is 410 or so. The top page says 406 but there are point estimates north of 410. Besides, we are in the drawndown phase of the oscillation. That means, with next winter’s decay, it’ll jump up. Mal Adapted, I don’t see why a carbon tax is not sufficient. As you steadily increase the tax, low or no emissions replace other power generation methods. And given that the tax will be steadily increase, people have a big incentive to invest in low emission technologies. In this case I’m a fan of markets and price signals. But will any government have the guts to do this before its too late? I’ll keep emphasizing that I’m not an expert on this (or any other) subject, and I’m not prepared to get into the weeds here. I can recommend, for example, David Roberts on the history of electrification in the US, and the need to restructure the regulatory framework governing utilities. In this case I’m a fan of markets and price signals. So am I, but I’m interested in whatever works. The best combination of market-oriented and regulatory measures is the one that will effect the carbon-neutral transition the soonest. hypergeometric is not wrong about the timeline. That’s not to say there aren’t issues of economic equality and social justice. Not going there, because I’m not an expert and I don’t know that anyone else is either! Sort of makes our discussion hypothetical, doesn’t it. Thanks as always for your clear exposition. I’m so glad you are here to do all the thinking and hard work! One can’t help but think that just like the “pause”, the “recovery” will blow up in their faces. Not a statistical observation, but I think the overall behavior of the arctic and melt/freeze dynamics have changed dramatically since 2007. I’m not sure there is much value in analyses like changepoint in predicting what might happen in upcoming melt seasons. We now have a system dominated by ever more thin vulnerable ice and less thick resilient ice which I think makes prediction increasingly difficult. I think that is precisely the point of statistical analysis – to tell you whether something has changed, or no, what you are seeing fits in nicely with what went before. The stats say things have changed, and you give some reasons. All good. Dr. Michael Mann said in 2014 that we need to keep CO2 under 405 ppm. I think he is right about that. The oceans (and planet for that matter) are heated in the tropics by intense sunlight from the sun located directly overhead. This ocean heat flows with ocean currents to the north pole and melts ice. 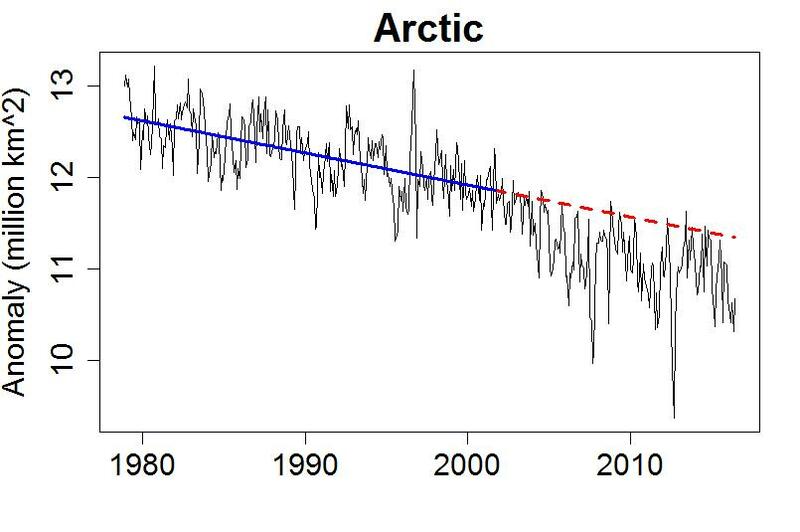 The sun angle in the Arctic Ocean is too low at ice minimum to cause any significant ocean heating. In fact increased sea ice melting cools the Arctic ocean as the exposed ocean sheds heat to the atmosphere – something that cannot happen with an ice cap. This of course raises air temperatures and contributes to ice melt as well. Let’s define the Arctic Ocean as roughly an area north of 75 degrees north latitude. The albedo of sea ice ranges from 0.5 to 0.7. The albedo of water averages 0.67 between 75 north and the pole. If you have ever watched the sun set over water you see the light reflected off the water. So the effects of albedo would be insignificant. The average temperature in the arctic in September is about -10 to -15 degree C.
The sea temperature can get no colder than about -2 degree C before freezing. Therefore the sea temperatures are much warmer than the air and the ocean will cool at those locations rather than be heated by the sun. But you still did not explain the observational evidence. The albedo of sea ice and sea water are about the same at Arctic latitudes at ice minimum in September. Accounting for albedo, the intensity of solar radiation in the Arctic is about 4 percent of the solar radiation in the tropics limiting the degree to which sunlight can warm the water. Sea water temperature in September in the Arctic can be no lower than -2 degrees C. Air temperatures at that time are -10 to -15 degrees C. Exposure of the warmer sea surface to the cold atmosphere will cool the water. Sea ice has a much higher albedo compared to other earth surfaces, such as the surrounding ocean. A typical ocean albedo is approximately 0.06, while bare sea ice varies from approximately 0.5 to 0.7. This means that the ocean reflects only 6 percent of the incoming solar radiation and absorbs the rest, while sea ice reflects 50 to 70 percent of the incoming energy. The sea ice absorbs less solar energy and keeps the surface cooler. Let’s unpack that a bit–because it’s not “any” effect. 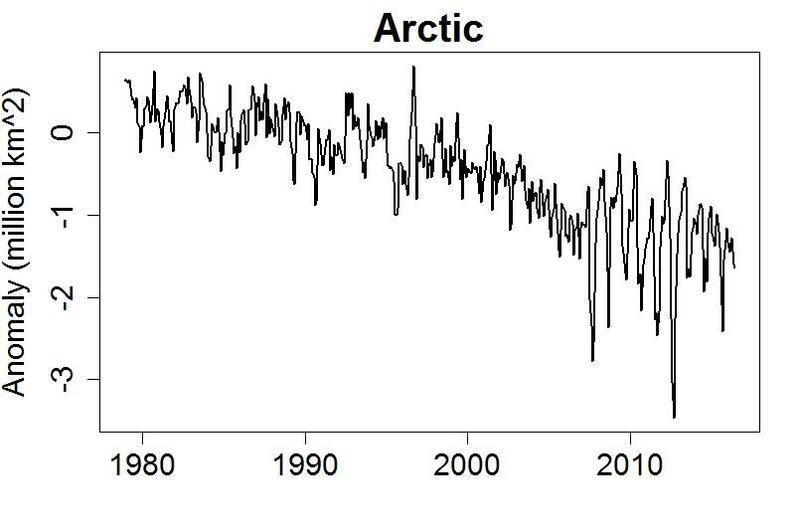 Because the decline in Arctic sea ice is most marked around the annual minimum, yes, that is when the ‘delta’ in albedo would be the greatest. 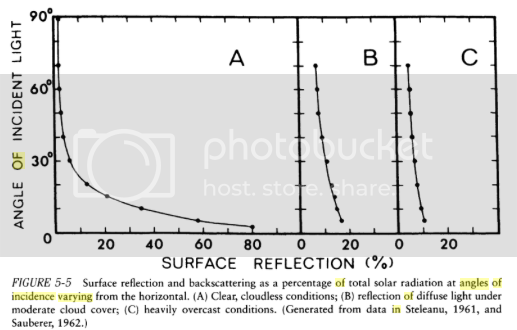 Even at a 10 degree angle, reflectance is only about 35%, but it does rise steeply from there. Since sunset is basically a once a year affair at the North Pole, occurring just after the autumnal equinox, it’s true that the solar angle in early September is darned low. That means that the greatest effect on absorbed radiation won’t be near the minimum, it’ll be earlier. And the total effect over a season will be a function of differences over the entire time, not just one portion of it. 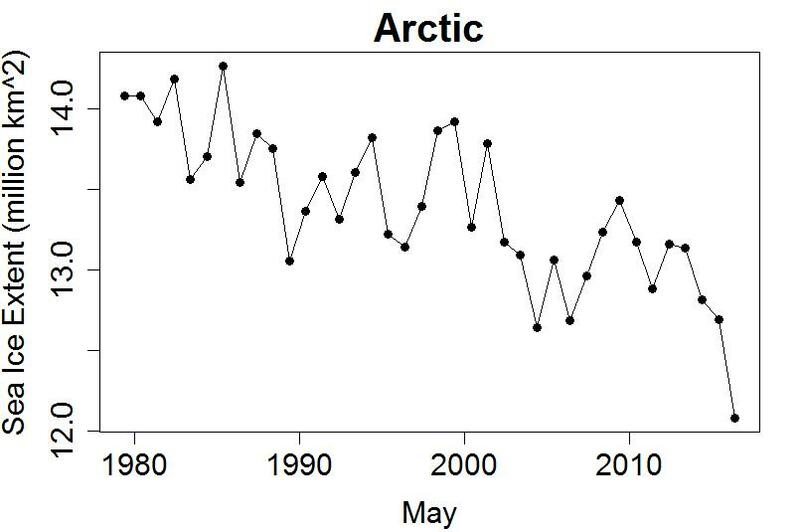 It’s worth noting that the decline in ASI extent for the month of June is about 10% since satellite records began in 1979. That’s pretty significant. Also, melt ponds appear as open water to the passive microwave sensors used to measure sea-ice concentration. Thus, an area of sea-ice covered by melt ponds appears to have a lower concentration than is actually the situation. That’s one reason that the so-called “sea-ice area” measure actually understates the true area covered by sea-ice. Regarding my spectacular “fail” wrt typical ocean albedo being approximately 0.06, the very chart that you provide shows that typical ocean albedo of 0.06 applies to the tropics and subtropics, and that the number increases dramatically in the higher latitudes. I don’t see any fail there. Regarding the higher sun angle at summer solstice, you should note the arctic ocean is almost entirely covered in sea ice at that time of the year, so most of that sunlight will be reflected back to space. I do note that the sunlight effects on the southern limits of the sea ice will warm the ocean at those locations. Oops, misthreaded my reply to Bill B, apparently. As noted above, the axis is clearly labelled “Angel of incident light,” which renders the interpretation of ‘degrees’ as denoting latitude a tad fanciful. Short answer: no, it quite simply is not. As you can see by inspecting any annual graph, by the time of the Solstice, extent has typically dropped about a third of the way, or even halfway, to the minimum. For instance, this year the Solstice saw an extent (according to ADS) of 9.57 million km2; the maximum was 13.96 million. 4.39 million square miles of open water that was ice-covered at the end of February. At fall equinox, September in the arctic, the angle of the noon sun (angle of incindence) is at zero degrees at the north pole; at 80 degrees north at noon the sun is at an angle of incidence of 10 degrees; at 75 degrees the sun is at an angle of incidence of 15 degrees: understand? At which time, perhaps as much as 20% of radiation is still absorbed, according to the chart I posted. At which time, ~60% is absorbed. Yes, I think I do. You? Doc – I think you still do not understand. You are confusing albedo or reflectance with solar insolation. Solar irradiance or insolation is the power (heat) received on Earth per unit area on a horizontal surface. At the equator at fall equinox a square meter of sunlight hits a square meter of the earths surface as the light is perpendicular to the surface. At fall equinox in the arctic a unit area of sunlight is striking an earth surface approaching infinity as the sunlight is almost parallel to the surface. So the heat gain in the fall arctic is reduced by the albedo of the sea water at low sun angles AND the larger unit area this sunlight is spread over. If that doesn’t work, go to the link directly. These data were obtained from NOAA ESRL. NASA GISS, including Gavin Schmidt, Walt Meier, Nathan Kurtz, and Charles Miller are holding a press event tomorrow, to “discuss recent trends in global temperatures and Arctic sea ice, as well as research now underway to better understand their impacts.” See http://www.jpl.nasa.gov/news/news.php?feature=6573 for details. The anomalies are measurements for a particular month (or year). Mean deviations are a group measure. other pole, the one down-under: study in Science indicates ocean warmth is primary driver of glacial melting on Antarctic Peninsula rather than warm air. I know these are dynamic systems, but since the atmosphere has only absorbed 2% of the heat produced due to small heat storage capacity, I don’t know why it would not be generally assumed that increasing warmth of ocean is going to be the primary driver of all ice and glaciers that have an ocean terminus/surface? We find each of these  heat wave characteristics to be rising significantly when measured over a five-decade period, with the annual number of heat waves increasing by 0.6 heat waves per decade for the average US city. Additionally, on average, we find the length of heat waves to be increasing by a fifth of a day, the intensity to be increasing 0.1 “C above local thresholds, and the length of the heat wave season (time between first and last heat wave) to be increasing by 6 days per decade. The frequency, duration, timing, and intensity of heat waves across all cities exhibited a statistically significant (p\0.001) positive trend over the 50-year period. In the average US city, the annual number of heat waves was found to increase by 0.6 additional heat waves per decade (0.6 HW ± 0.14/decade), heat wave duration extends a fifth of a day per decade (±0.06/decade), and heat wave intensity increases by 0.1 “C above local thresholds per decade (±0.04). We also find the heat wave season to increase by 6 days per decade (±1.6). On average, the heat wave season starts 3.5 (±1.3) days earlier and lasts an additional 2.3 (±1.2) days longer in each decade. To confirm the statistical significance of these trends, we conducted repeated measure ANOVAs and employed post hoc pairwise comparisons using Bonferroni correction. We found statistically significant differences between the first and last decades in the analysis (1960s and 2000s) for all four heat wave characteristics. Of the four characteristics, heat wave frequency was found to be increasing most consistently during this period, with a significant increase between each decade except from the 1970s to 1980s. Given the relatively modest-sounding numbers cited in the second paragraph above, it would also be nice to have some insight into what they imply (given whatever we know about the statistical distributions involved) about changes in *risks* in these parameters. I don’t know much about the subject area Habeeb, et al are exploring, but I find the use of Bonferroni corrections both questionable and old time, even if these were standard methods back in the day. (“Old time” means there are much better ways of assessing the results these days.) I can’t say anything about the subject itself, and would say Habeeb, et al otherwise know their stuff. Unless you really want me to delve into Habeeb, et al, which I can, I don’t have much more to say. While the atmosphere may absorb very little heat from the sun, it can pick up latent heat from lakes and oceans which can be transported to sea ice and ice sheets where it condenses and every gram of water vapor melts 7 grams of ice to produce 8 ml of runoff. And, water vapor in the atmosphere is a powerful greenhouse gas allowing local solar warming. Thus, a hundred mile wide ocean current can carry a lot of heat, and a local wind can disperse that heat across thousands of miles of ice. The heat ends up as the heat that melts ice, and the Arctic warms, even though the average heat content of the Arctic atmosphere remains is low, incident radiation averages out to be relatively low, and Arctic albedo averages higher than the albedo of the tarmac at the Dhahran Airport. On the other hand, the heat from that part of the Middle East is transported (a very little at a time) by wind to the Indian Ocean, and by ocean currents to the Arctic. Winds and even ocean currents are like hoses for heat. If you are filling your swimming pool, It is not how much water is in the hose, it is how fast the water in the hose is flowing. Even a 4″ fire hose will not fill the pool, unless a stream of water is moving through the hose. And, somewhere there must be a source of water to flow into the hose. The Arctic would not warm if the Tropics were the same temperature as the Arctic. 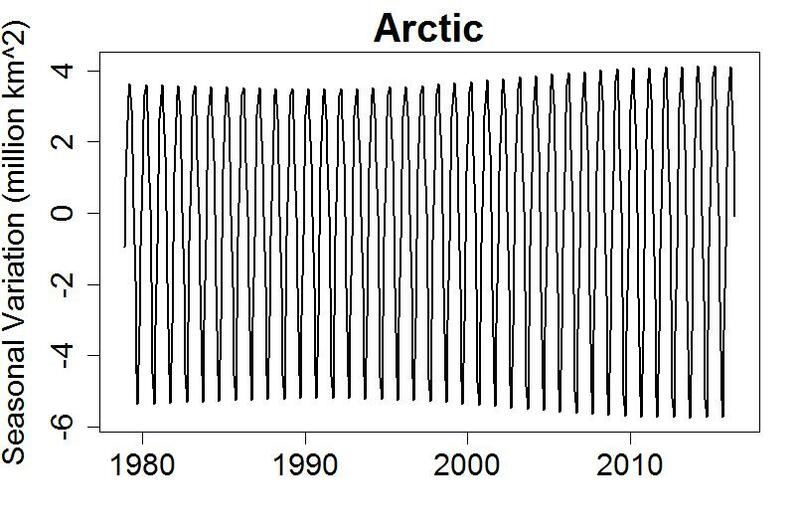 Plotting temperature in the Arctic by lat, long, and season is an average of heat flows- some small part of which is locally absorbed solar radiation. A part that gets larger as there is less sea ice, and lower albedo. On the other hand, as the Arctic warms, the flow in all the heat hoses changes. As the Arctic warms, both ocean circulation and atmospheric circulation change. the bottom ( sea )? similar quantity ( 1 to 8 ratio )when happening to both ice and snow? Thanks in advance to anyone who can shed more light on this subject. Top or bottom melt? is a very good question and depends on which little bit of ice you are studying, and when you are studying it. Factors include the temperature of the water under the ice, salinity of water under the ice, air temperature, relative humidity, wind velocity, solar radiation, and the current albedo of the ice, any melt ponds, and local atmospheric conditions that aid or hinder radiation of heat from the ice into space. Mechanical energy from wind can fracture and actually warm ice. So can wave action from storms in nearby open water. All of these can change rapidly over short distances and over short time periods. Ice near its melting point tends to be discontinuous. A cold dry wind can help keep the ice strong, hard, and intact. A cold atmosphere can cool the ice enough that it thickens by freezing the water below. A clear atmosphere allows heat conducted into the ice from the water below, to be radiated into space. On the other hand, the water below the ice will mostly be at 0C and so will not contribute to cooling the ice. So if there are greenhouse gases over the ice that hinder heat radiation into space, and the ice picks up a bit more heat from warmer waters below, the factors that contribute to the loss of ice are both above and below. Which predominates is a function of where and when. 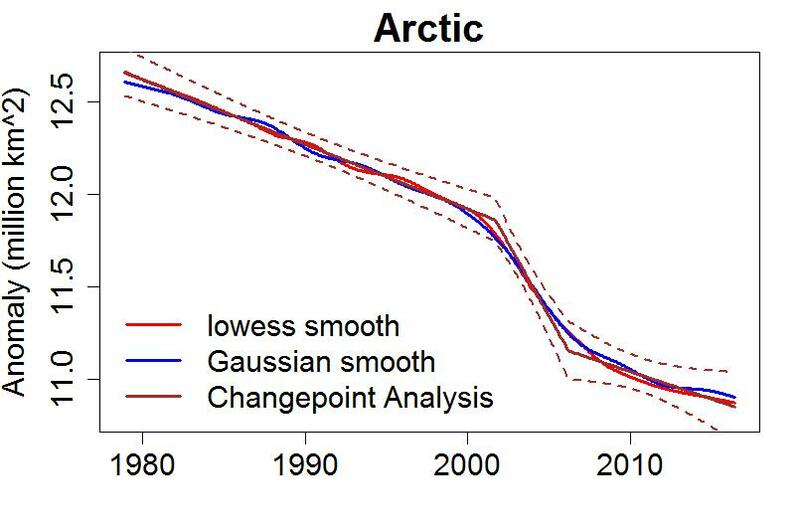 Li D, considering the large seasonal changes in sea ice I’d say Arctic sea ice is melted more from above than below. Sea ice ‘extent’ is usually defined as the area of Arctic ocean surface with at least 15% sea ice coverage, so compaction of the ice, which is largely wind-driven, influences the value. Storms can break up sea ice, which can also quicken the decline. Melt pond area (‘holes’ in the floating Northern ice cap) can make a difference, as open areas of water absorb more sunlight, warming the water in the ‘ponds’ and quckening melt. 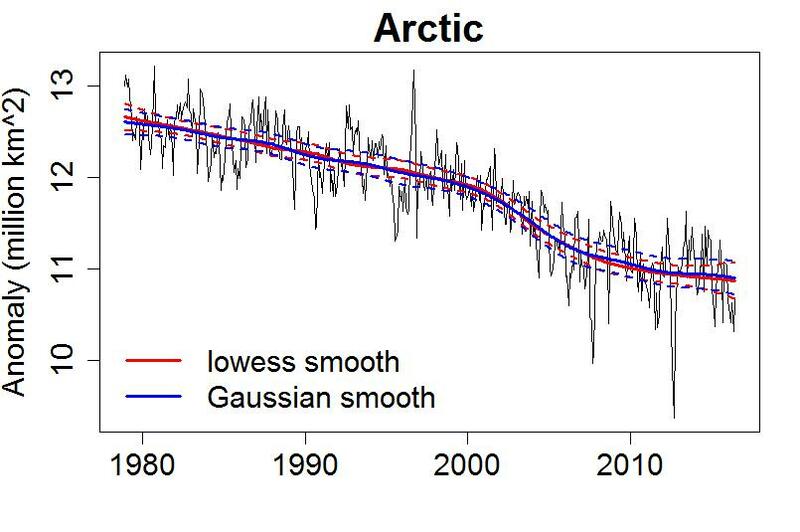 Some Arctic sea ice is lost through it being transported out of the Arctic into warmer waters at lower latitudes, so prevailing winds and how fast/early the bottlenecks melt out over the season is another influence. Cloudiness through the melt season is another factor. Along with air temps, these factors have the larger combined impact than sea temps. Insolation (incoming solar radiation) is the chief driver of seasonal change. 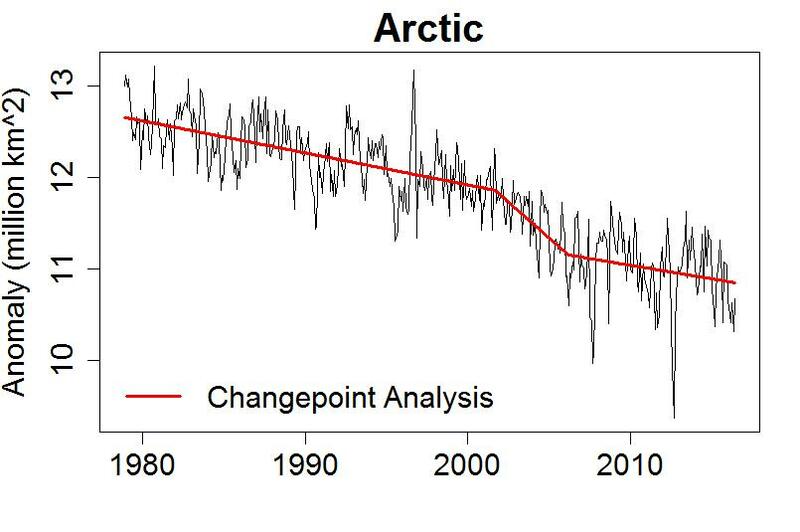 The long-term decline is of sea ice is due to the warming of the atmosphere and underlying ocean over time. For the satellite period of record for sea ice coverage (1979-present), air temps have risen twice as fast as sea surface temps in the Arctic. 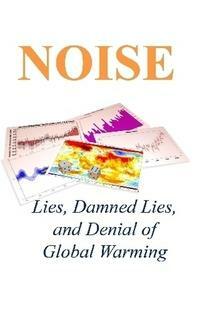 One of the excellent blogs on climate is Neven’s Sea Ice Blog. Neven posts bi-weekly updates, and the regulars contribute a lot of useful stuff in the comments. You’ll get a much better informed answer than mine if you post your question there, Li D.
Not an expert, but from my reading, 1) there’s a lot still to learn on that score, and 2) to the best of current knowledge, it depends quite a bit on local conditions. Yes, if quantity is measured by mass. Keep cool, eastern North America.